Get professionally designed marketing items without the work! 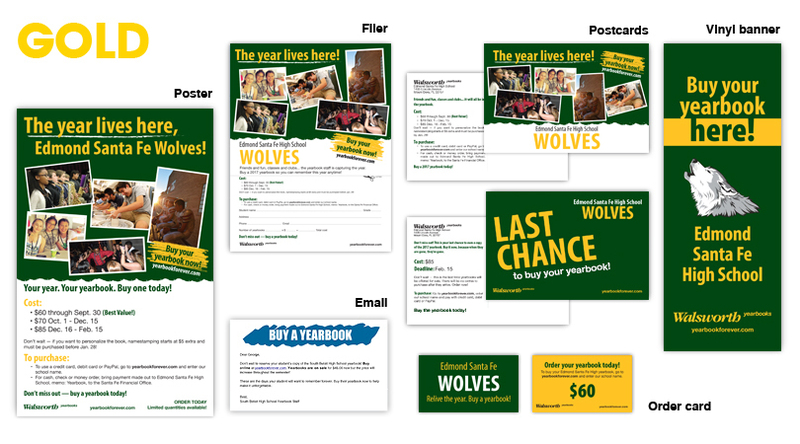 Our designers will create fliers, order forms, posters, event cards and more with your school’s colors, mascot, photos and pricing information. Check out the price list. Select your items from the form below. If you are not ready to submit this form, click the “Save and continue later” button at the bottom of this page. Don’t forget to enroll your school in PEP and get automated emails sent to parents every few weeks! Learn more here. This email address must be able to receive large file attachments (up to 10MB). Note: FedEx cannot deliver to PO Boxes. The following information will be placed on your marketing items (if applicable). 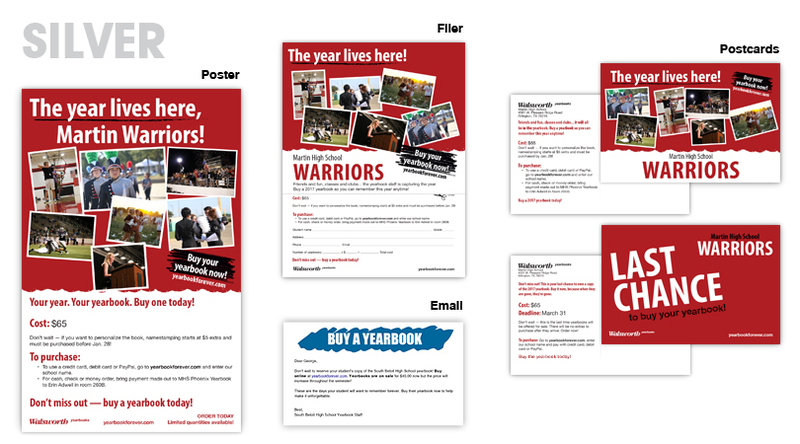 All prices and dates will be taken from your Yearbook Sales and Yearbook Ad Sales pages in Members Only. 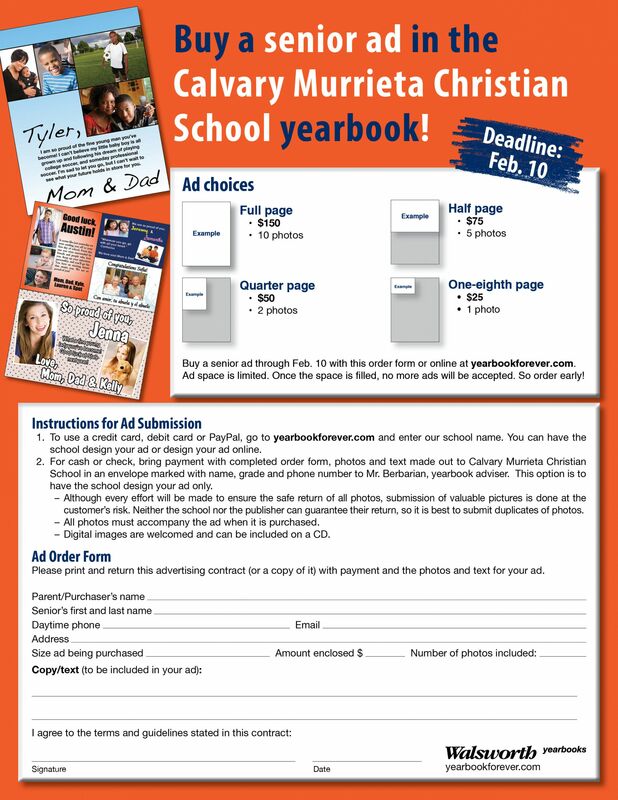 Where and when can parents and students buy the yearbook at school? Select the item or items you wish to order and provide the requested information. If you would like to see a preview of one of the available options, select the example link below. When would you like your first postcard to mail? I will upload my student list in Members Only within three to five days of placing order. Timing: Allow 5-7 business days to receive proofs. Once you approve and upload your mailing list to Marketing Central in Members Only, allow two business days for items to mail. 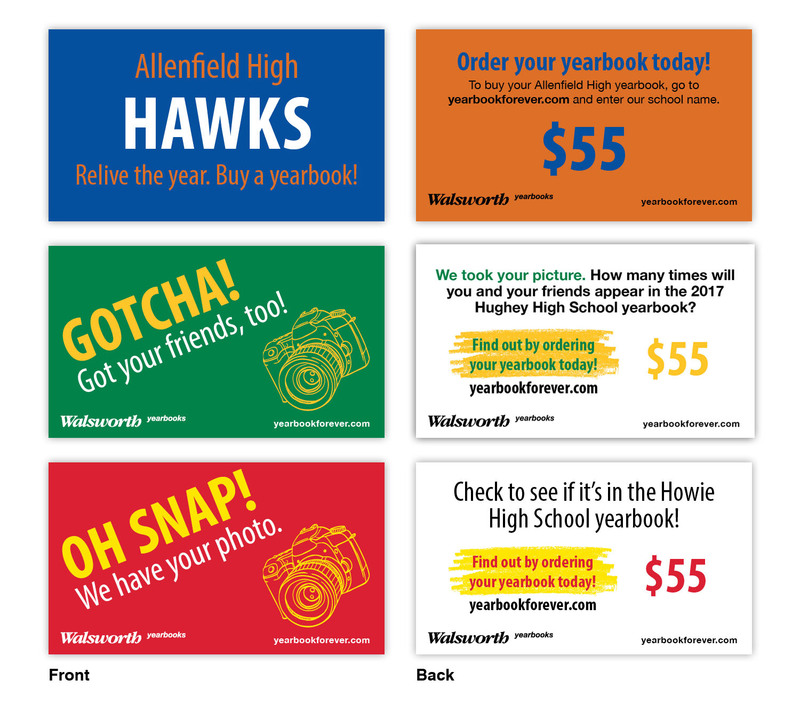 Costs: Above costs include postage for mailing the postcards, but do not include shipping all other items to the school. Art time charges for up to one hour are included. 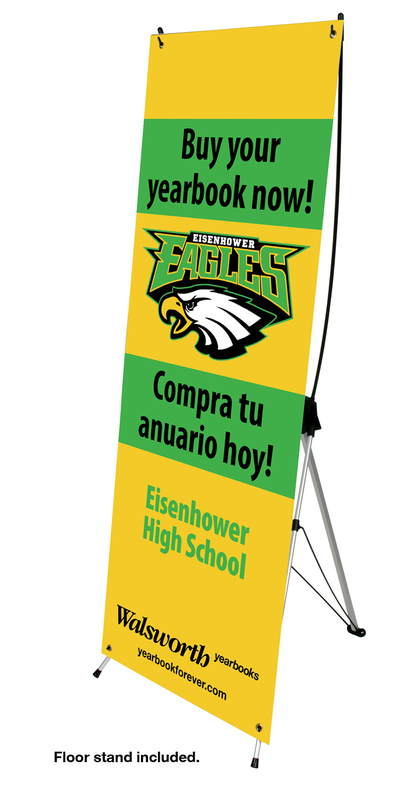 Cost includes vertical banner stand. Banners are recommended for indoor use only. 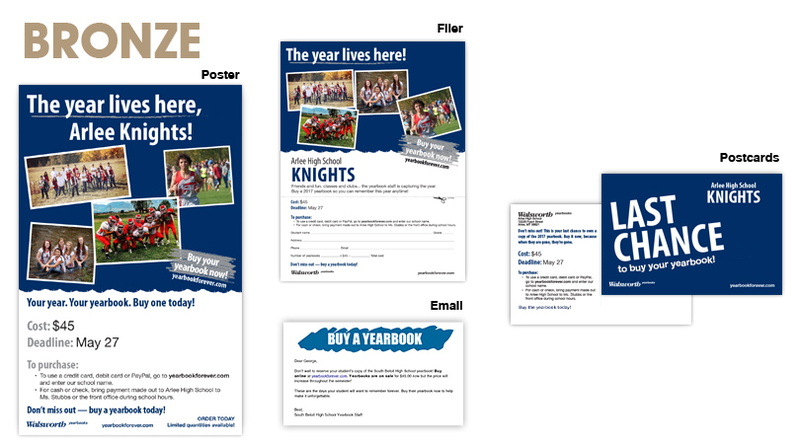 Our research shows when you market at the school (fliers, postcards, order cards, social media and more) AND add on email marketing to parents, your sales can take off! Emails with awesome student photography, a compelling yearbook message and a link directly to your school store on yearbookforever.com. Emails sent to parents every three weeks when you have your online yearbook sales turned on. Parents are removed from the list once a yearbook is purchased for their child. Sign up today and take advantage of this powerful, free program! For more information, email us at pep@walsworth.com or visit www.walsworthyearbooks.com/pep. Size: 14x22. Select printer, quantity, and message. Who is printing these posters? Send me a print-ready file that I will print at the school. I want Walsworth to print this item. The costs do not include shipping charges. Art time charges for up to one hour are included. Relive the year anytime. Buy a 2019 yearbook. And it's covered in the yearbook. Buy a 2019 yearbook today. Your year. Your yearbook. Buy one today. Buy a yearbook now. Enjoy the memories later. In your yearbook. Forever. Buy one. Posters have a standard headline: "The year lives here." Select from the prepared text choices above. Copy will appear under the school name and mascot. Sneak Peek example and Full Cover example. Size: 14x22. Select version, printer and quantity. Walsworth will provide your cover image for your poster. Above costs do not include shipping charges. Available One-sided book sales flier example and Two-sided book sales flier example. Need an order form right away? Our editable order form PDFs are ready for you to download, add your details and print. Click here. Size: 8.5x11. Select printer, quantity, one-sided or two-sided flier and message. Who is printing these fliers? Above costs do not include shipping charges. Art time charges for up to one hour are included. [Parent Audience] This school year will live forever in the pages of the yearbook. 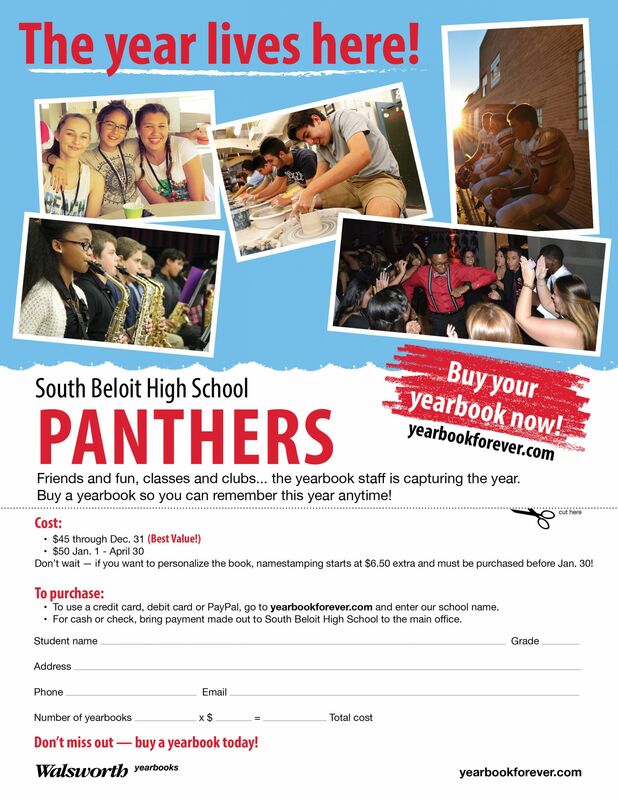 Help your student remember friends, classes, fun and more by purchasing a yearbook for them today. [Parent Audience] As your child and friends are taking part in this school year, the yearbook staff is capturing the story of the year so it will live forever in the yearbook. 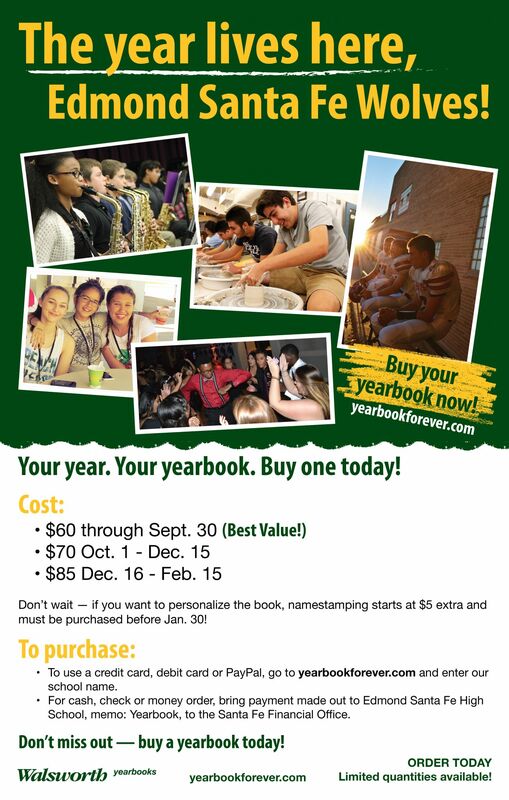 Buy your student the best book of memories of this year – buy a yearbook. [Parent Audience] The events of this school year will have meaning for your student today and for years to come. Help bring back fond memories. Buy your student a yearbook today. [Parent Audience] Your child spends a lot of time at school, creating memories in and out of class. Those memories will live on in the yearbook. Buy a yearbook so they can always remember. [Parent Audience] Don't miss out. Buy a yearbook now for the opportunity to relive the school year later with your child. It's easy. [Student Audience] Friends and fun, classes and clubs... the yearbook staff is capturing the year. Buy a yearbook so you can remember this year anytime. [Student Audience] This school year will live forever in your yearbook. Buy a yearbook. It's easy. [Student Audience] Don't miss out! 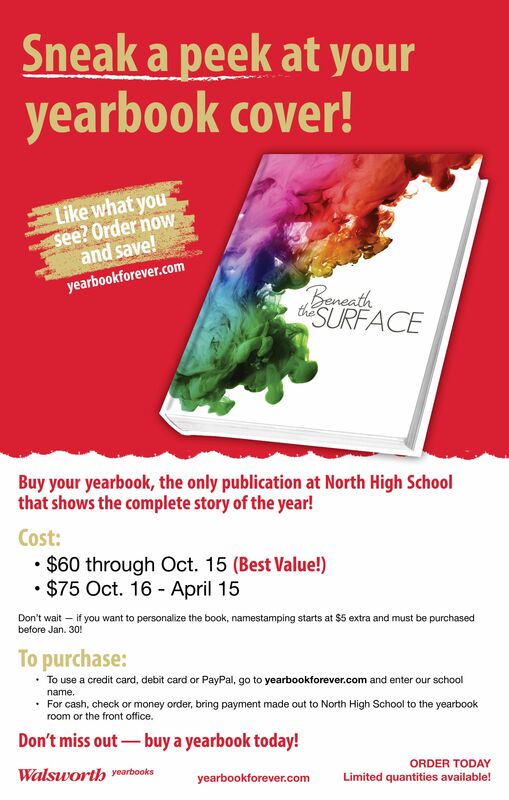 This is your chance to own a copy of the yearbook. Buy it now, so you don't feel left out when your friends get one. Select from the prepared text choices above. Copy will appear under the school name and mascot. One-sided ad sales flier example. 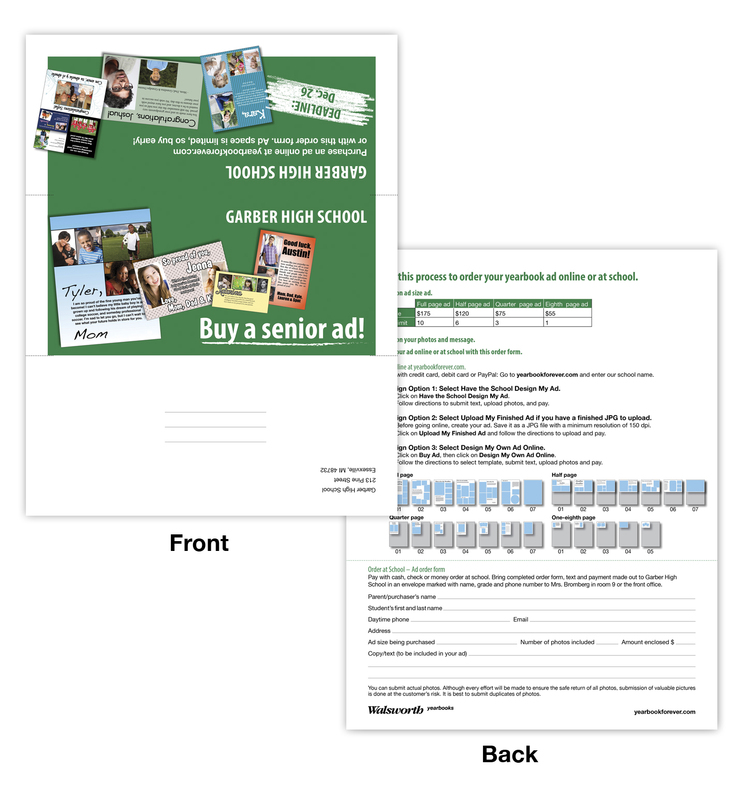 Contact us at schoolmarketing@walsworth.com if you would like to order customized ad sales fliers and someone from Walsworth will get back to you within two business days. Size: 4x6. Select printer, quantity, mailer and message. Who is mailing these postcards? 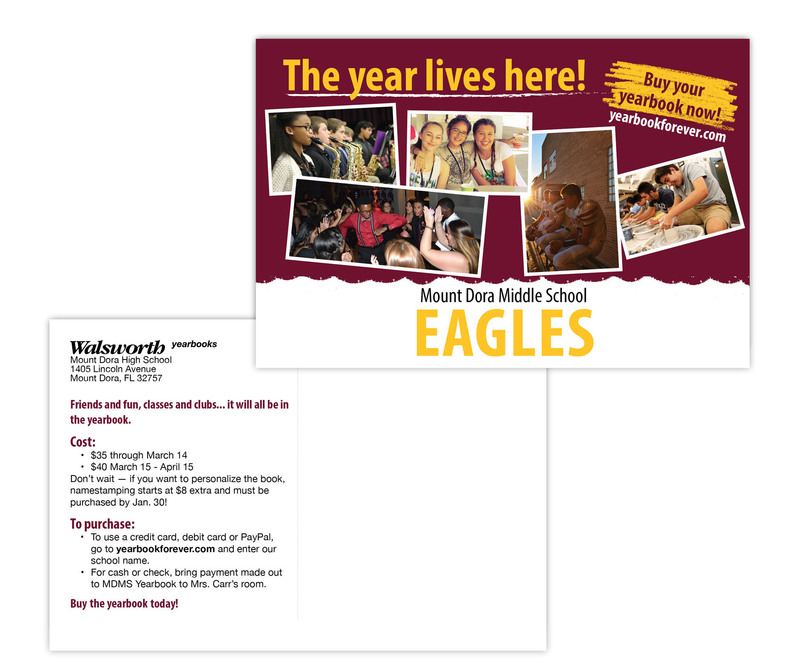 Walsworth can ship all printed postcards to you for distribution or we can mail these for you! Above costs don't include shipping or postage charges. Postage as of January 21, 2018 is $0.35 for 4 x 6 cards. I will upload my student list in Members Only or send it to my sales rep within three to five days of placing order. [for parents] Let your child relive this school year anytime. Buy a yearbook. It's easy. [for parents] Your child spends a lot of time at school, studying and having fun. Buy a yearbook so memories of this year will last forever. 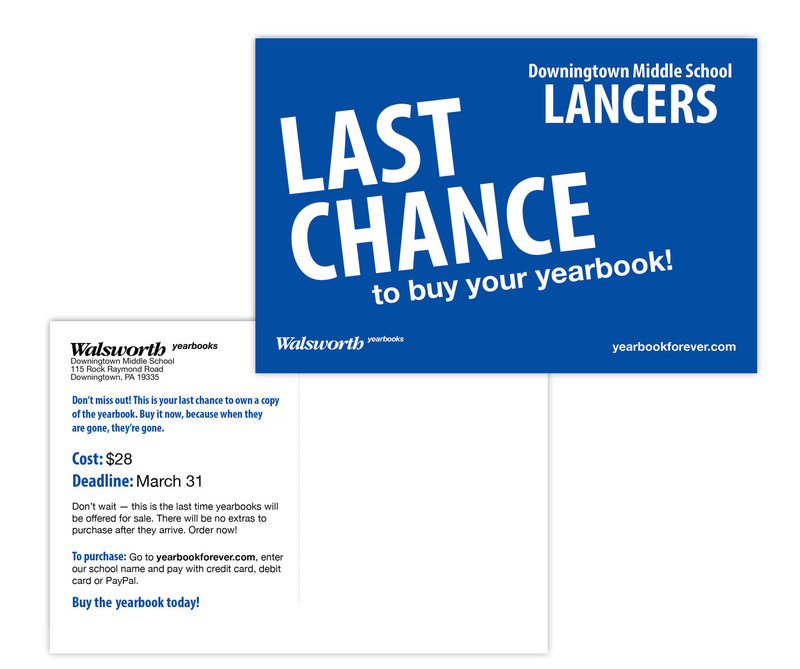 [for parents] Last chance to buy your child a yearbook! Don't miss out! Buy it now, because when they are gone, they're gone. [for students] Friends and fun, classes and clubs... it will all be in the yearbook. Buy a yearbook so you can remember this year anytime. Select from the prepared text choices . Copy will appear under the school name and mascot. Size: 4x6. Select printer and quantity. If you would like to include an image of ads used in your book, please upload them. If not, we will use standard ad images. Who is printing these postcards? Select quantity, mailer and message. 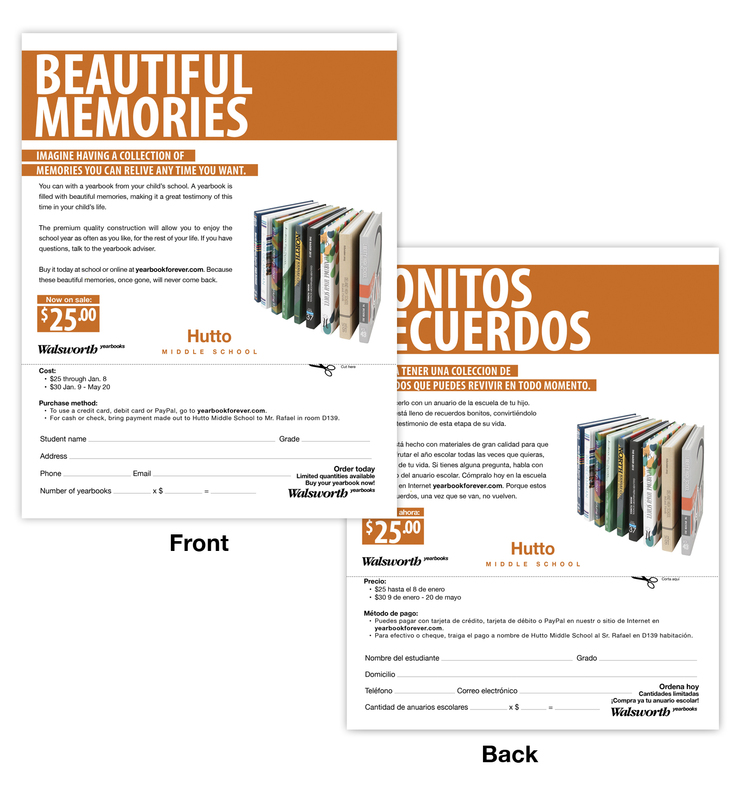 Package includes two-sided flier/order form (8.5x11), one external/mailing envelope and one internal/return envelope. 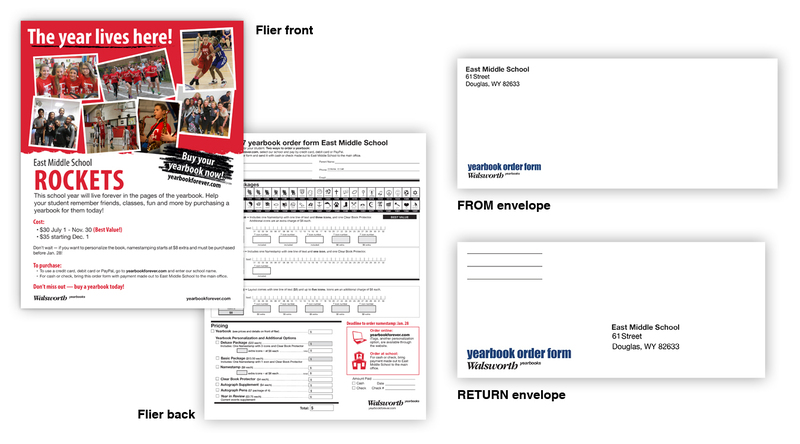 Return envelope will have the school’s mailing address pre-printed for parents to send payment to the school. Price does not include postage. Who is mailing these envelopes? 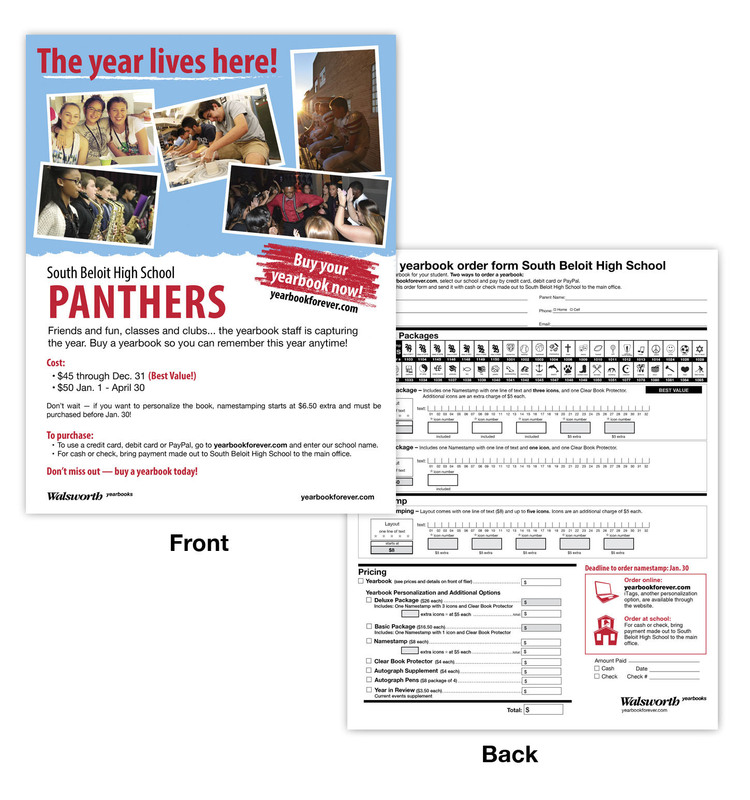 Walsworth can ship all printed forms and envelopes to you for distribution or we can mail these order forms directly to parents for you! Above costs don’t include shipping or postage charges. Postage as of January 21, 2018 is $0.55 per envelope. Parents will have to apply postage to their return envelope for mailing. Select from the prepared text choices. Copy will appear under the school name and mascot. Want order cards right away? Our editable Order Card PDFs are ready for you to download, add your details and print. Click here and search under guerrilla marketing. Size: 2x3.5, two-sided. Select printer, quantity and message. Who is printing these order cards? Oh Snap! We Have Your Photo. Gotcha! Got Your Friends, Too! Select from the prepared text choices. Size: 8.5x11, two-sided, 80# cover stock paper. 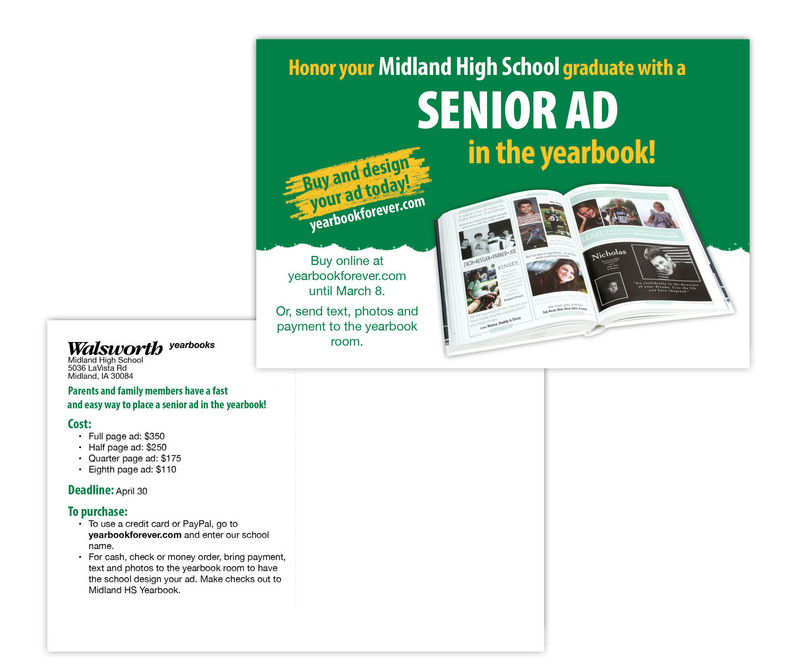 These brochures do not include areas to customize with your school images. Select printer and quantity. Who is printing these brochures? Size: 24x63, one-sided. Select quantity and message. Banners are recommended for indoor use only. Please submit your mascot/logo image at 300 dpi or greater to prevent pixilation. Above costs include banner, stand and carrying bag. Above costs do not include shipping charges and taxes if applicable. Art time charges for up to one hour are included. Select from the prepared message above or submit your own message, which can be a maximum of seven words. Size: 8.5x11, two-sided. Select printer, quantity and message. Imagine having a collection of memories you can relive any time you want. You can with a yearbook from your child's school. A yearbook is filled with beautiful memories, making it a great testimony of this time in his life. The premium quality construction will allow you to enjoy the school year as often as you like, for the rest of your life. Buy it today at school or online at www.yearbookforever.com. If you have questions, talk to the yearbook adviser. Because these beautiful memories, once gone, will never come back. This yearbook captures beautiful pictures of your child's life in school. Don't be the only one to miss them. Your child is in the yearbook. It's a very special memory that you can share with family and friends. Because if there's something we parents love, it's showing off our children. Buy it today and enjoy it forever. 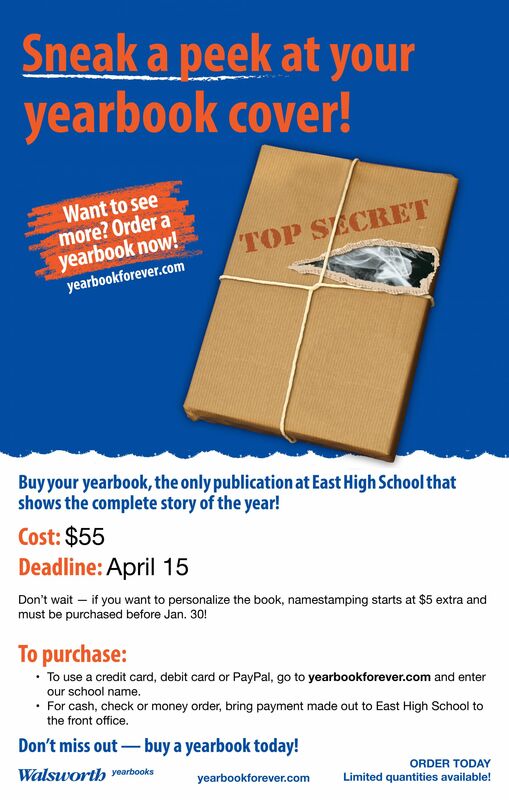 You can order your yearbook at school or online at www.yearbookforever.com. If you have questions, talk to the yearbook adviser. Hurry! Don't let time take these memories away. You still have time to buy your yearbook. But hurry, there are only a few left. And as all stages in life, once they're gone, they don't come back. Get your yearbook today at school. It's your last chance. Give your child a book as beautiful as his memories. Don't miss the opportunity to preserve these memories forever. There are a few yearbooks left and once they're sold out they won't be printed again. Get yours at school before it's too late. Select from the prepared message choices. All will appear in both English and Spanish. Enter your price increase deadline, regular price and lower price below, if needed. Size: 4x6, two-sided. Select printer, quantity, mailer and message. The costs do not include shipping charges and taxes if applicable. 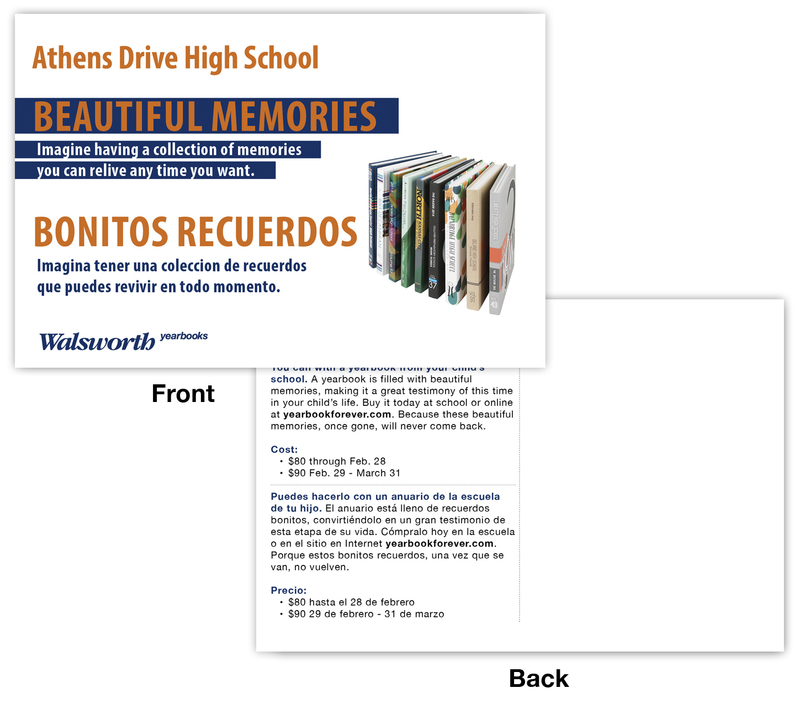 Walsworth can ship all printed postcards to you for distribution or we can mail these for you. Above costs don't include shipping or postage charges. Postage as of January 21, 2018 is $0.35 for 4 x 6 cards. Size: 24x63, one-sided. Select quantity and message. Banners are recommended for indoor use only. The costs include banner and stand. The costs do not include shipping charges and taxes if applicable. Art time charges for up to one hour are included. Select from the prepared message above or submit your own message in both English and Spanish, which can be a maximum of 14 words. All will appear in both Spanish and English. Any additional information to add? Please make sure images are 300 dpi. If you don't upload school photos, we will select photos from the Walsworth Photo Contest. You will receive a PDF proof for approval within 7-10 business days. For printed items: prices and products are subject to change; after proof approval, items take 3-4 business days for printing; and items requested sooner will have a rush charge added. Please note that your order will be charged to your Walsworth account after your proof is approved. When ready, click Submit to send your request. If you want to save the form, click Save and Continue Later.